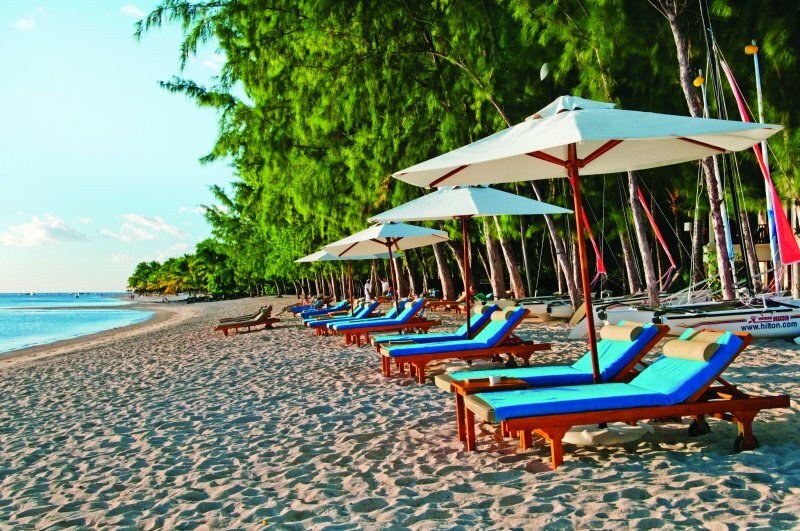 Visit Mauritius with us and stay in trademark comfort at The Hilton Mauritius Resort. 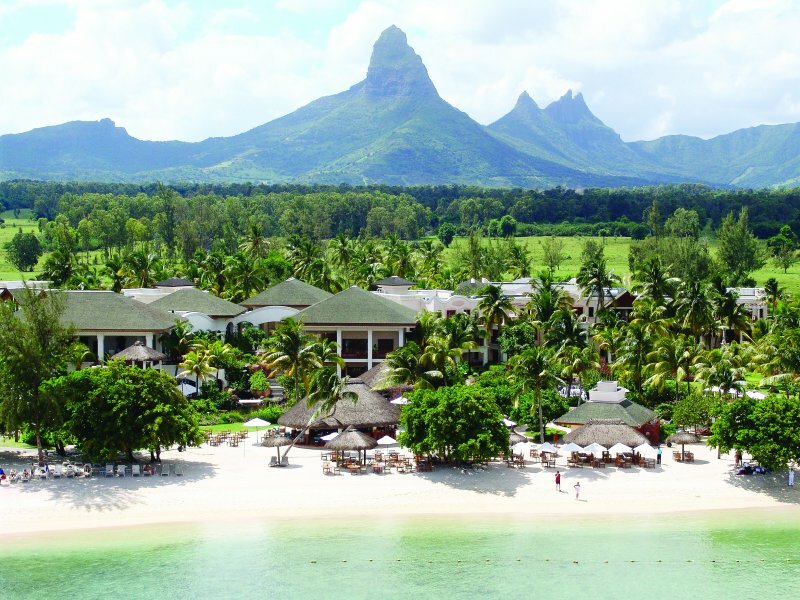 Situated on one of the best beaches in Mauritius, Flic-en-Flac, The Hilton Mauritius offers you more than 3km of powder white sand and calm crystal blue waters to relax on and enjoy. 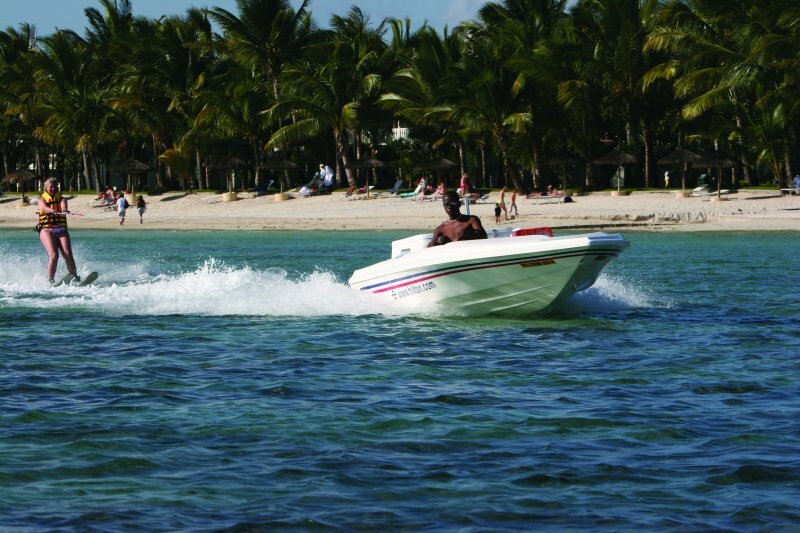 Travel to Mauritius knowing that you will be well cared for in a style that is world famous. Wake up to this Mauritian-style 43m²/463sq.ft sea facing room with a balcony and wireless internet access. The spacious room, in cool, calm tones, has 1 king bed and large windows. Get to work at the desk, curl up in the large armchair with ottoman or re-energize in the marble bathroom. Special touches include the fluffy bathrobe, mineral water and flowers. Maximum occupancy 2 adults and 1 child under 12 years old. Wake up to this Mauritian-style 43m²/463sq.ft sea facing room with a balcony and wireless internet access. The spacious room, in cool, calm tones, has twin beds and large windows. Get to work at the desk, curl up in the large armchair with ottoman or re-energize in the marble bathroom. Special touches include the fluffy bathrobe, mineral water and flowers. Maximum occupancy 2 adults and 1 child under 12 years old. Indulge yourself in this comfortable 74m²/796sq.ft sea facing corner suite with separate living room and balcony. The contemporary suite, in original design, has 1 king bed and 2nd bathroom. Get to work at the desk, surf the web with wireless internet access or relax on the sofa. Refresh in the marble bathroom with walk-in shower. Special touches include bathrobe, flowers and fruit. Maximum occupancy 2 adults and 1 child under 12 years old. Spoil yourself in this spacious 92m²/990sq.ft sea facing suite with separate living room and large balcony. The bright and airy suite, in local design, has 1 king bed. Work in comfort at the desk area, check your emails with wireless internet access or recline on the sofa. Refresh in the marble bathroom with separate walk-in shower. Special touches include bathrobe, flowers and fruit. Maximum occupancy 2 adults and 1 child under 12 years old. Enjoy a home away from home in this stylish 61m²/656sq.ft sea facing suite with a balcony, seating area with sofa and wireless internet. 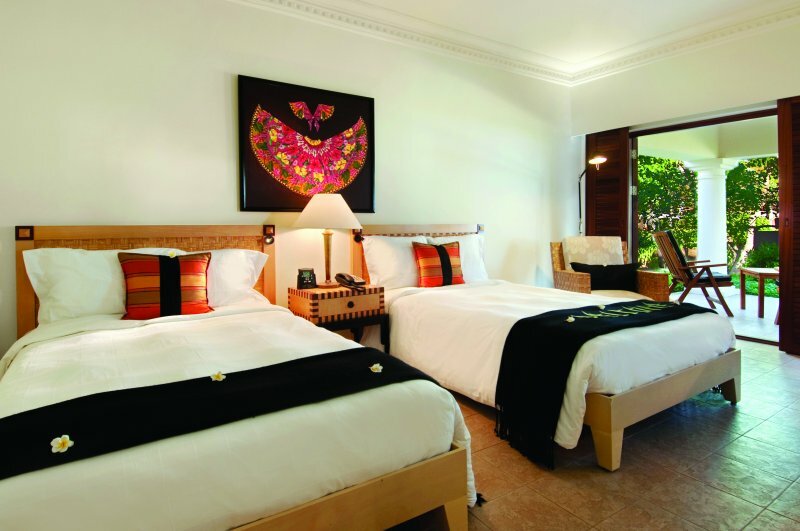 The Mauritian-style suite, with large windows, has 1 king bed. Get to work at the desk, relax in the large armchair with ottoman to watch the 27-inch TV or refresh in the marble bathroom. Spoil yourself with the fluffy bathrobe and mineral water. Maximum occupancy 2 adults and 1 child under 12 years old. Savour the panoramic ocean views from this luxury 208m²/2239sq.ft sea facing suite with separate living room, dining room, kitchenette and spa. The spacious suite, in local design, has 2nd bedroom and bathroom. Enjoy a meal at the dining table or recline on the sofa to watch DVD’s on the TV. Stay in touch with wireless internet access and in-room fax or unwind by pampering yourself in the Jacuzzi. Special touches include bathrobe, slippers, mineral water, flowers and fruit. Maximum occupancy 4 adults. Make this spacious 105m²/1130sq.ft sea facing suite your home away from home with large living area and direct access to the beach. The bright and airy suite, in local design, has 1 king bed. Enjoy a meal at the dining table, check your emails with wireless internet access or recline on the sofa to listen to the CD player. Re-invigorate your senses in the marble bathroom with walk-in shower. Special touches include bathrobe, slippers, flowers and fruit. Maximum occupancy 2 adults and 1 child under 12 years old. Cross a small wooden bridge to discover this gourmet restaurant in a peaceful setting. The Melanzane restaurant offers refined seafood cuisine with flavours from Europe and the Mediterranean. 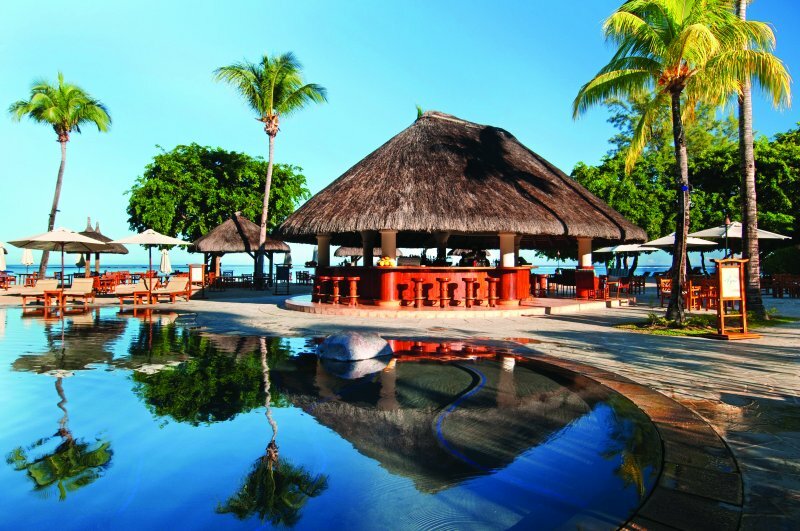 Dine in the romantic Thai pavilion at the Hilton Mauritius Resort & Spa. This à la carte indoor themed restaurant features original wood decor and artwork from Thailand with views of the pool. Guests can enjoy a tempting choice of spicy Thai noodles and seafood dishes at this Mauritius restaurant. Set by the beach, overlooking the beautiful lagoon, this Hilton Mauritius Resort & Spa’s informal restaurant is open for lunch daily. 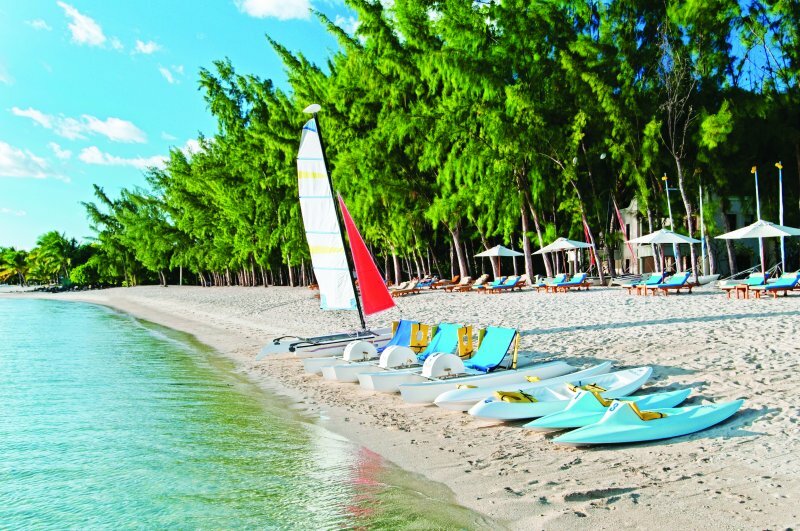 Enjoy fruity cocktails, sizzling grills, sandwiches, pizzas and local dishes served under little huts with your feet in the sand at this Mauritius restaurant. Sip a rum cocktail and watch the sun set over the Indian Ocean at the Vista Bar, offering magnificent views across the lagoon. Enjoy the Happy Hour with live pianist to accompany your aperitif every evening. This is the perfect place to watch the daily Torch Lighting Ceremony. Please note that evening dress code is smart-casual with long pants for gentleman. Located between the pool and the beach, this bar is the hub of the resort. For a refreshing cocktail in the shade, meeting friends or watching events and shows, the Aqua Bar always has a fantastic and fun atmosphere. La Pomme d’Amour serves buffet-style meals. Enjoy delicious breakfast and themed evenings daily in this airy and romantic setting overlooking the beautiful lagoon and ocean beyond. Please note that evening dress code is smart casual with long pants for gentleman.